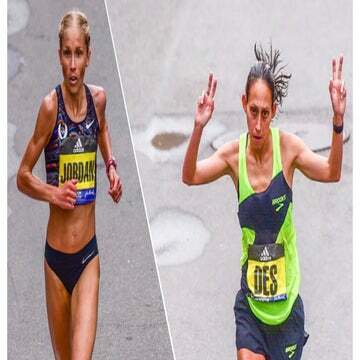 There was little doubt who was going to win from early in the 26.2 miles, but Americans Desiree Linden and Jordan Hasay landed in the top five. When Worknesh Degefa of Ethiopia decided to make a move, she didn’t hesitate. She just went for the win at the 2019 Boston Marathon at mile five—a brave decision for a woman who had never seen the course before. Degefa, 28, was indeed the fastest on paper coming into the race with the 2:17:41 she ran in January at the Dubai Marathon. She asserted her position earlier than most would ever dare, surging before the 10K mark to lead by a substantial margin for the remainder of the 26.2 miles, finishing in 2:23:31. Edna Kiplagat, 39, of Kenya was second in 2:24:13. Jordan Hasay, 27, was third, finishing in 2:25:20. 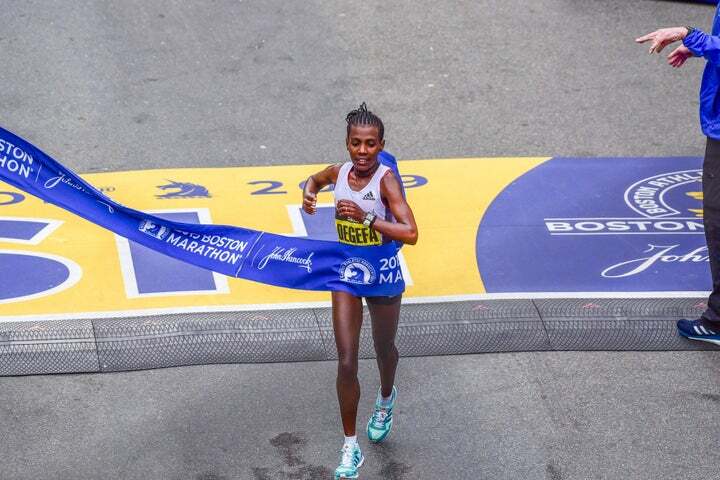 Worknesh Degefa of Ethiopa wins the 2019 Boston Marathon. 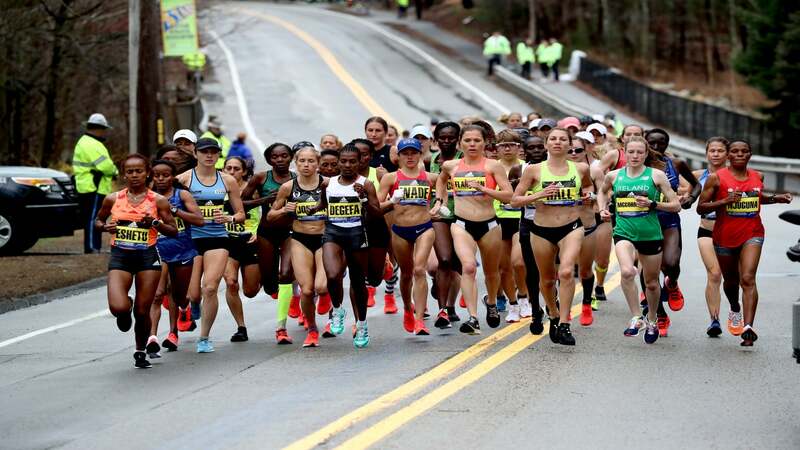 The race began in Hopkinton, Massachusetts, under misty conditions—after early morning thunderstorms, it was 61 degrees with 84 percent humidity. Degefa built a gap on the chase pack—which included defending champion Desiree Linden—that at its peak was more than three minutes. Around mile 21, Kiplat pushed into second place, eventually cutting Degafa’s lead down to 42 seconds. “[I thought] if we keep increasing the pace, we might catch her before the finish,” Kiplagat said, adding that she realized pretty quickly that the race didn’t have enough miles left for her to go for the crown. Kiplagat, who is a two-time world champion in the marathon as well as winner of the Boston, London, and New York City marathons. She is a mother of five and said after the race that her family is relocating from Kenya to Boulder, Colorado. Although she couldn’t match what Kiplagat had in the later miles, Hasay nabbed her third podium finish in the three marathons she’s entered (all of them third place). She scratched from the 2018 Boston Marathon the night before the race and spent the past year treating and recovering from stress fractures in her left heel. On Monday, Hasay, 27, who trains with the Oregon Project in Portland, was grateful to compete again. She said she was anxious in the opening miles, when Degefa took off early and two others tried (and failed) to go with her, but knew the pace was too much too early. Linden, the defending champion, placed fifth on Monday. Although she won’t add another crown to her collection this year, she was still pleased with her race. As she made her way down Boylston Street, the crowd gave her a lively and loud applause. She acknowledged her fans with fist pumps and blew some kisses. But did she get choked up? Depends on your definition. American Lindsay Flanagan finished in in ninth place in 2:30:07. Degefa earns $150,000 for taking first, Kiplagat gets $75,00 for second, and Hasay takes home $40,000 for third.